The week of February break, many of our students were off on vacation, enjoying the slopes or the beach. But other daring adventurers among us were going on daily quests and discovering their inner superhero during our Superhero Minicamp at Cowper. The week began bright and early Monday morning. Mini-campers were organized into two groups - the combined Pre-kindergarten and Kindergarten classes, and the Nursery class. The Pre-Kindergarten and Kindergarten mini-campers began their adventures by reading about a superhero during circle time and discussing what qualities make someone a superhero. We decided that superheroes are people dedicated to helping others with their special powers during emergencies. Then, each camper came up with his or her own superhero name, special power, and slogan and drew a picture of their new alter ego. Campers discussed different types of emergencies, how each student’s new special super power could be helpful, and which superheroes would work best together. We had so many ideas that we decided to create our own superhero comic book! We took a field trip to the Cubberly Public Library for inspiration for our comic book. At the library, we saw many different types of comic books and discovered new superheroes. As we walked home from the library, campers were abuzz with ideas and excitement. Next, the mini-campers created something every superhero needs – a costume! Campers designed superhero logos with letters, symbols, and shapes that represented their hero’s different qualities. We placed the logos in the center of superhero capes we made from a t-shirt, glitter, fabric markers, and fabric paints. 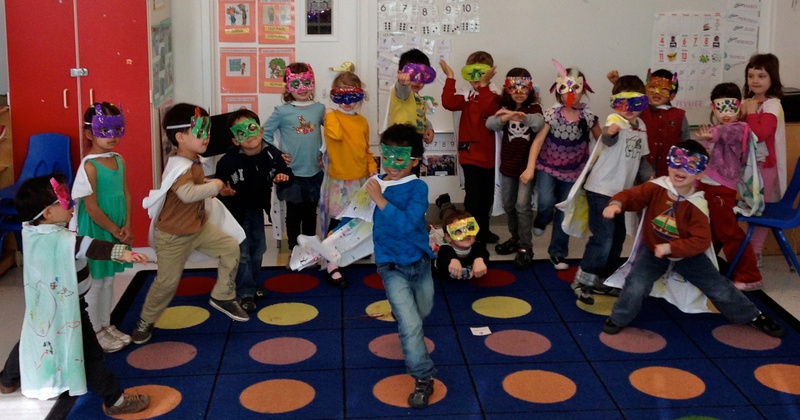 Then, mini-campers handcrafted beautiful papier-mâché masks, which they decorated with their hero’s symbols and colors. With our superhero costumes complete, the possibilities for adventure were endless! On Friday, as our week of heroism came to a close, we were excited to finish our superhero comic book. Each student took home a personalized comic book with original pictures, stories, and copies of everyone’s superhero profiles. We are happy to announce that Our Superhero Adventures Comic Book will be available for all to read and enjoy in the Cowper library.